Growing up, my parents always inspired me to go to school, work hard, and give 110% to whatever I did. It definitely paid off. I earned three degrees, worked for a U.S. Congressman, and then became a Presidential Management Fellow where I worked with some of the most senior government officials at the U.S. Defense Department in Washington, DC. But I wanted more. After several years in Washington, D.C. working as a policy advisor and in public affairs, I decided to try something different and work in public relations. I didn’t know much about this career choice until I did my research and spoke with friends in Washington who worked in PR. Then I took the risk, moved back to Chicago, enrolled at DePaul University to obtain a second Master’s degree, and started working in the PR world. What I discovered next did not shock me, but it did intrigue me. There aren’t many Latinos in PR. I wondered why I didn’t see more Latinos working in PR. Latinos are great storytellers, over-index on using social media usage, and their purchasing power in the U.S. is over a trillion dollars. 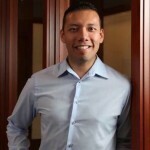 I then deliberated…how can we get Latinos more involved in the PR career track? Realistically, there is a lot of work to be done to make this happen. I have seen commercials and ads depicting Latinos in a negative or stereotypical way. We shouldn’t tolerate this. Latinos should immerse themselves in PR, advertising, and marketing careers to develop a cognizant market of respect and positivity for Latinos as a whole. With Latinos consuming much of the mainstream media, my concern is that many PR agencies are having difficulty understanding the cultural market, let alone the Latino market. We need to realize Latino Millennials are the most willing to consume media. They are heavy users of mobile devices and social media platforms. The Bureau of Labor Statistics reported that only 10.5% of people employed in public relations in 2014 were Hispanics. Sadly, the field of PR still lacks diversity. In a profession that represents the views of multiple stakeholders, this needs to be changed. With Latinos spending power upwards of $1.5 trillion and their social media usage higher than any other group, it is shocking to see that Latinos are not fully represented in the PR profession. By 2042, more than half of U.S. consumers will have an ethnic background. For those of us in PR and marketing, it is essential that we understand that the U.S. is already well on its way to becoming one of the most pluralistic and multicultural nations in the world. It is no longer acceptable to pigeonhole folks of a certain background to work with only their background – instead, if PR agencies have more of a diverse workforce, they will develop a deeper trust and connection with brands who understand them from a variety of social, political, economic and cultural backgrounds. More cultural inclusion in the PR sector will target their audiences the right way and not marginalize them with the stereotypes we sometimes see on product advertisements. Let’s be realistic and look at the facts that exist. Evidence keeps piling up as more studies confirm that U.S. Hispanics lead the general population in social media, mobile and e-commerce adoption. 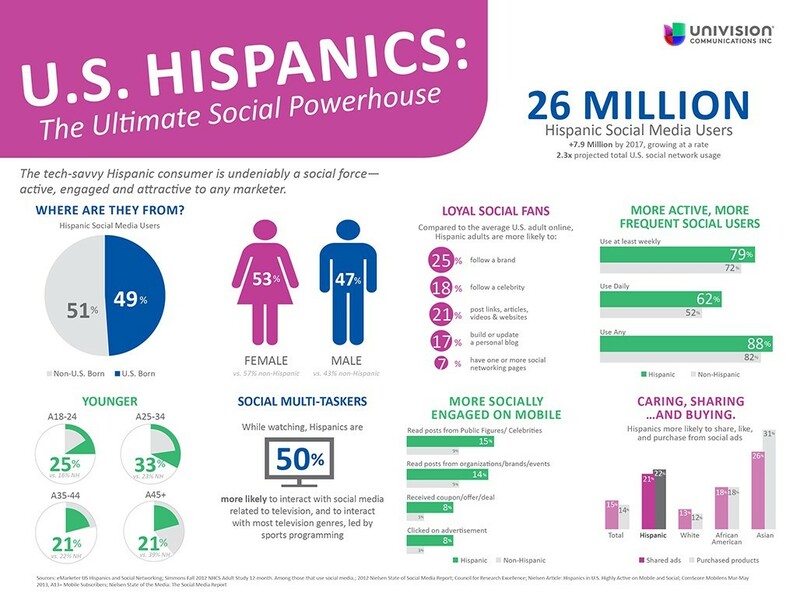 According to the Pew Research Center’s Internet Project, 80% of U.S. Hispanic adults use social media, compared to 72% for the country overall, with 68% of U.S. Hispanic adults saying they used Facebook, Twitter or similar platforms, compared to 58% for the U.S. population. Therefore, PR firms need to realize Latinos are a target group that cannot be ignored or mistreated. PR agencies should host a high school or college outreach session. This outreach session could lead to a mentorship program. Identify students interested in the PR profession and offer to guide them in the process of selecting a major. Latinos currently in the PR profession should participate in programs that do outreach and promote the public relations profession to high schools, primarily those with large concentrations of the Latino population. Inquire if your place of employment has an ongoing diversity initiative and offer to volunteer or participate. Many firms and corporations have established ambitious diversity initiatives to address the lack of racial minorities in our industry, while others have adopted a broader approach. Connect with local community colleges in the area and offer to do a presentation on public relations to Latino organizations. Battling the lack of education about our industry is a must. PR agencies should develop their aspiring Latino PR professionals to become prominent in their profession through training, networking, and mentorship. Overall, developing workforces for certain career tracks is never easy. This starts with our youth and educational programs as well as hiring practices and employee development. But there is a need for PR agencies to change their hiring practices. At FCG, we don’t just accept diversity, we embrace it and appreciate it. There are Latinos like myself who are in the PR world and have professional skill sets that are transferrable to the PR profession. Hiring Latinos will definitely change the way PR agencies conduct business because they understand cultural sensitivities and how to appropriately apply them while marketing to minority groups.